Why have SIPs remained buoyant despite Nifty volatility? When markets were buoyant, flows would pick up rapidly and when the correction set in, these flows would start tapering. In fact, after the 60% market correction between 2008 and 2009, equity mutual funds saw negative flows each month till the end of 2013. In the past, mutual fund flows were correlated with market conditions and foreign institutional investor (FII) flows. When markets were buoyant, flows would pick up rapidly and when the correction set in, these flows would start tapering. In fact, after the 60% market correction between 2008 and 2009, equity mutual funds saw negative flows each month till the end of 2013. It was only around early 2014 that we actually saw positive flows into equity funds coming back in a big way. This trend has sustained till date. However, there is one more interesting sub-trend that is now visible. Even in 2015 and early 2016, when the markets corrected sharply, the flows did take a hit. Since the beginning of fiscal year 2016-17, however, SIP inflows on a monthly basis have been consistently growing irrespective of the vagaries of the stock market. Monthly SIPs are all about retail investors putting their monies in equity funds and ELSS funds and are the best proxy for equity inflows. 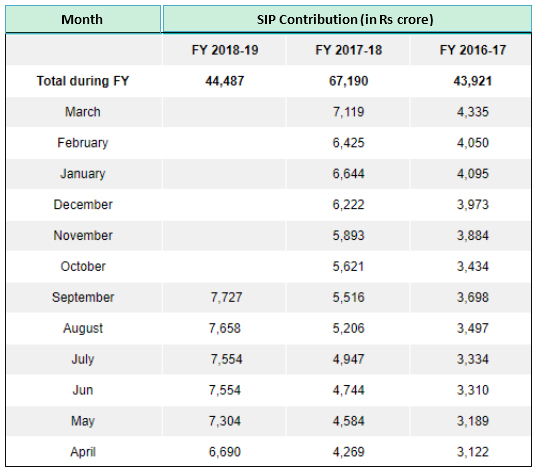 In the current fiscal 2018-19, the monthly SIP flows have reached above $1bn per month. The monthly trend almost reflects a growth of 1.5 times over the previous year and a growth of 2.5 times over the year before that. During this period, there have been intermittent corrections including the latest correction in September 2018. Despite that, SIP inflows have continued to increase. What explains this curious shift? One reason could be that equity investors are finally realizing the importance of long-term investments and systematic investing. After all, long-term investing gives you the benefit of volatility reduction and also rupee cost averaging by adopting a phased approach. For example, if you bought an index fund at the peak of 2008, the returns over the last 10 years would have been 60%, which is an effective CAGR return of 4.8% annualized. This is less than what you would have earned on a liquid fund. Instead, if you had structured the same investment as a SIP, your returns would have been around 15% per annum. That is the power of rupee cost averaging, which investors are now realizing. In the last 2 years, there has been a steady and silent influx of young investors into equity funds. For example, the number of equity folios stood at 3.6cr in June 2016, 4.8 crore in June 2017, and nearly 5.8cr in June 2018. This sharp increase of 1cr equity folios each year has largely come from young and first-time investors who have consciously adopted the equity SIP route to long-term wealth creation. This point is related to the previous point on the influx of young people into equity fund SIPs. Today, there are fewer people investing at random in equities and equity funds. That was the case earlier. Thanks to the spread of robo-advisory and automated portfolio planning, investors are more willing to actually start off with their long-term goals in mind and work backwards towards their investments. This means that SIPs on equity funds are being tagged to goals and is making these investments less vulnerable to the gyrations of the Nifty and the Sensex. Some numbers coming from smaller towns are quite staggering. According to AMFI data, while the SIPs for fiscal 2017-18 grew 89% in the top-15 cities, the growth was nearly 96% in case of the next-15 towns. Out of the 1cr new SIP registrations in India in the last fiscal, nearly 55% came from the B-15 towns. These places were investing in gold, property, and bank FDs for a long time. With all these avenues becoming less attractive, there is a gradual influx of non-metro funds flowing into equity SIPs. This money is less volatile and does not shift rapidly based on the gyrations of the Nifty and Sensex. 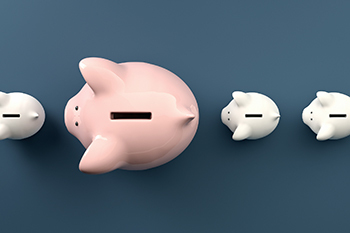 Mutual fund intelligence is reaching out to smaller towns through the power of mobiles, faster broadband connectivity, and more granular local language content. This has created a major client funnel for mutual funds. The whole idea of investing as low as Rs500 per month and creating a substantial corpus is intuitively appealing. What is actually happening today is that mutual funds are finally becoming a non-metro mass product. E-KYC has only given an additional boost to the entire process. Above all, this money also tends to be a lot stickier and long-term in nature.